1 Caption: Picture of a child with ringworm, which is not a worm. 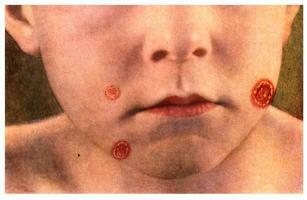 Ringworm is caused by a fungus. 2 No, bad bugs don't fly or crawl, but they do make you sick. Germs such as bacteria, viruses, fungi, and protozoa are often called "bugs." They are everywhere. Here is what you should know about these "bugs." 3 Bacteria are the oldest form of life. They are found on almost every surface. But you might never see them in your lifetime. Bacteria are very tiny creatures. You would need a powerful microscope to see them. 4 Although you can't see them, you can be affected by bacteria. They cause many diseases in humans. Some of these include strep throat and pneumonia. Bacteria can also cause wounds to become infected. Bacteria on food that is not handled properly can cause stomach illnesses. 5 Luckily, infections caused by bacteria are easily treated. Doctors use drugs called antibiotics to treat these diseases. Vaccines have also been developed to help prevent more serious diseases that are caused by bacteria, such as whooping cough.